This is an expansion of the original post “Five Ways for Liberals to Overcome Those Red State Blues“. The first way to shake those Red State Blues is to connect. A sense of isolation is the most prominent aspect of being liberal and living in a red state like mine, Oklahoma. Everyone wants your email address. If you are willing to share it, you will not be ignored. That’s not the hard part. Managing the avalanche of emails once you start sharing is the hard part. So, unless you are good at using Hotmail or Gmail tools that allow you to sort different kinds of emails as they come in, just set up a new email account that you will use only to give out to political organizations. This type of search will work for any state or city in which you live. As you can see there are plenty of avenues right here in this big-time red state of Oklahoma. If there are options to connect here, then there are even more options in your state. 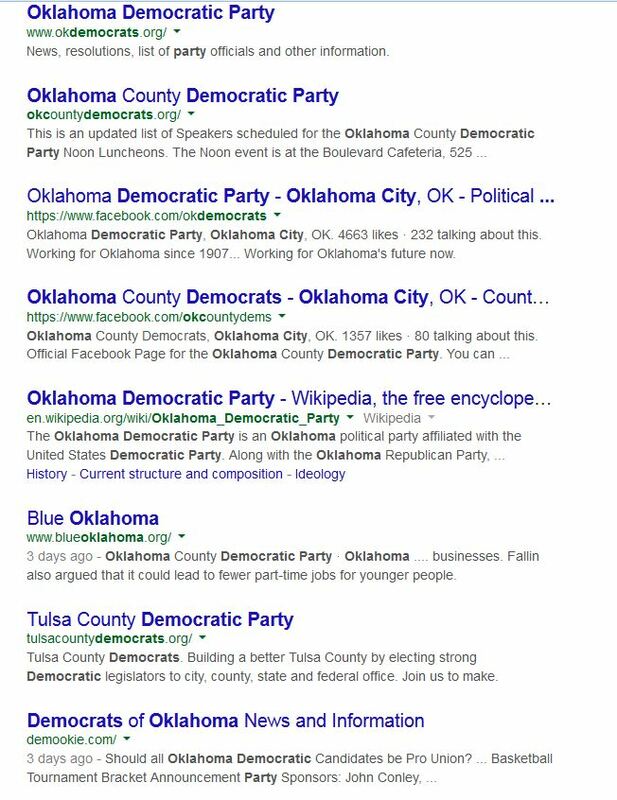 Here in Oklahoma, the website to start will be: OkDemocrats.org From there you can find local groups in your county and city. And yes, sometimes I get plenty disappointed in the national and state Democratic Party. But the reality is that the two “bigs”, Democratic and Republican parties, are very broad coalitions that help people find their way into more specific groups. On Twitter: The obvious first step is @OkDemocrats. @OkPolicy is a good think tank to give you some hard info from the Progressive perspective. Pay attention to those emails from Twitter that give you some ideas about who to follow and expand your followings to stay informed. On Facebook for Oklahoma: I have found many good groups to join that have kept me informed beyond the right-wing hype of big media controlled by corporate and conservative agendas. Especially helpful are the local state affiliates with Move-On.org. Since I have been a teacher of many sorts, I also am a part of several Facebook groups that focus on education issues. OkDemocrats is a good start on Facebook if you are in Oklahoma. Face-to-face contact is the ultimate way to shake those Red State Blues. Political campaigns are a good way to get that type of contact with others whose beliefs are like yours. Especially now, as primary season is underway, you will not have a hard time finding a campaign that would be glad to put you to work at their campaign headquarters doing all kinds of simple things or, if you are more brave, helping to knock doors and place signs for the candidate. Listen to public radio to hear announcements that will give you ideas of events where you may meet fellow liberals for fun and dialogue. If you start with NPR.org, you can find the local affiliates in your state there. In Oklahoma, the two NPR stations are KOSU.org and KGOU.org, both connected to our largest universities. Have you found good ways to connect to others who hold some of the same political views as you do? Let us know in the comments. (I will approve any comment that is not obviously a troll from the right trying to disrupt the conversation.) Or, comment in social media through Twitter @OklaBrett if you are outside of Oklahoma or @BrettDOkc if you are in Oklahoma. The pattern of political action for liberals and progressives goes much like this: Get fired up about a particular candidate. Work hard and get emotional about the outcome. If the candidate loses, fade away, never to be heard from again. If the candidate wins, fade away, never to be heard from again. It’s time for that to end. Too much is at stake in our future. Campaigns are critical. However, turning over the long-term political discussion to voices on the right produces a political landscape where we only consider a narrow set of options from the right, none of which are good or remotely logical. For politicians on the right, the only logic is how to deliver power to their benefactors whose only logic is, of course, their power. The irony with progressives loosing heart and relaxing the pressure between campaigns is this: Because of a lack of political muscle developed between campaigns, it is harder to elect the best candidates when the time actually comes to elect them. In Oklahoma we see this behavior repeated with agonizing consistency. Case in point: Recently, there was a very good, necessary, and spirited campaign for mayor in Oklahoma City between progressive city council member Dr. Ed Shadid and incumbent Mayor Mick Cornett. As a part of Shadid’s campaign to raise awareness of too many shadowy machinations about a convention center idea, a petition was started to get more sunlight onto the studies that had been done. After Shadid lost an uphill battle against the strong incumbent, the petition drive fizzled so that it was never even delivered on the deadline. It is clear that if progressive thought will have an impact in very red states like Oklahoma, there needs to be a constant commitment to progressive values and thought between campaigns. 1. Support the candidates that represent your values and ideals whether you think that they have a chance of winning or not. I hear too many people talk themselves out of helping with a good campaign just because they think the candidate won’t win. That’s not the issue. The public needs to hear what that candidate has to say, especially if they are challenging an incumbent that has been too much of a gofer for big money donors in the shadows. And, if the points the candidate is making are important now, they are important in between campaigns, too. 2. Support that candidate again if they want to run again. Look at how many times influential office holders in U.S. history have lost before they won that influential position. Being a good, tough politician is about coming back from defeat. Like a good cage fighter, a politician has to be able to take several hard punches in order to stay in the fight. If your candidate can, they are worth supporting no matter how much of a long-shot others may think they are. One thing for sure, they will never win without your support, and those important ideas will never influence anyone without your being the carrier of them. 3. Learn as much as you can any way that you can about issues that concern you. A part of influencing others between campaigns is knowing what you are talking about. People can tell if you do or don’t very quickly and will either listen or turn you off accordingly the next time you speak to them. In Oklahoma, a very good progressive think tank is the Oklahoma Policy Institute, which also has a good daily podcast to keep you up to date on legislative matters. 4. Learn from national news sources to compare with local ones. There is now a large volume of information available to progressive thinkers about a number of issues that may affect your state. In central Oklahoma, The Oklahoman is usually read by we progressives with a side eye. The local TV stations also reflect a corporate media view that fails to ask the biggest, most important questions. Very strong state-wide sources like the Oklahoma Policy Institute and national sources are important tools for calling out local right-wing-influenced media. That activity will have an impact upon newsroom discussions. Participate in your neighborhood association. Accept a leadership position in your neighborhood association. Organize your precinct or ward for your party. Run for a school board seat. Oklahoma and other deep red states are starting to cause great suffering among common people because the political field has been left to right-wing radicals between campaigns which led to unopposed or weak opposition in the next round of campaigns. It’s time for progressives to stand up and join the debate for logical thinking and sunshine on all things public. Enter your email address to subscribe to this blog and receive notifications of new posts by email and a monthly newsletter. Award-winning journalist. Photojournalist. Member of Investigative Reporters & Editors or IRE. Member of the Society for Professional Journalists. © Brett Dickerson and Life At the Intersections, 2011-2016. All rights reserved. Unless otherwise credited, photos are by © Brett Dickerson, 2011-2015. All rights reserved.